Dr. Gretchen D. Oliver, director of the Sports Medicine and Movement Laboratory in the College of Education’s School of Kinesiology, is a certified athletic trainer, a Fellow of the American College of Sports Medicine, and a corrective exercise specialist. 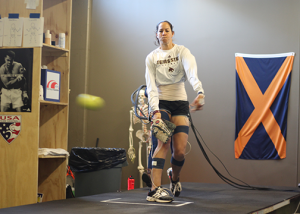 She is also a prolific researcher, having published 60 papers in the past five years, mostly on the biomechanics of throwing. This focus remains the same whether Oliver is working with her main clients, young baseball and softball pitchers, or with Major League baseball organizations that are coming around to understand that there’s more to pitching than being born with a golden arm. Oliver received her Ph.D at Texas Woman’s University in 2002 and served on the faculty of the University of Arkansas from 2006-2012. She excelled there as the Clinical Coordinator of the Graduate Athletic Training Education Program and Director of the Sports Biomechanics Group. Oliver points out that Auburn’s throwing lab is bigger than the one at the American Sports Medicine Institute (ASMI), which is considered the “gold standard” in sports medicine. The Houston Astros roving pitching coach also reached out to Oliver about revamping the team’s throwing program. Even as she is advising MLB teams, Oliver focuses with equal intensity on young performers. In fact, most of her lab work here in Auburn involves young pitchers. Oliver’s lab employs an electromagnetic motion capture system (called “the Flock of Birds”) via the MotionMonitorTM software system. This is a three-dimensional system that allows her to collect kinematic, kinetic, and EMG data for all her participants. Oliver and various Kinesiology students and faculty colleagues attended virtually every game for this year’s Auburn softball team that excelled in the College World Series and won the SEC Tournament. Oliver and her colleagues observed many practices throughout the year and had the players in the lab to apply the science to the sport. Several of the AU softballers, in fact, are College of Education majors, and Coach Clint Myers is a big advocate of the good work coming out of the lab. Likewise, Oliver has worked with USA Team Handball athletes, in addition to serving as Medical Director of USA Team Handball and athletes from other sports, including lacrosse players. She has worked with NCAA All-American and Olympic Gold Medalist softball star Cat Osterman. 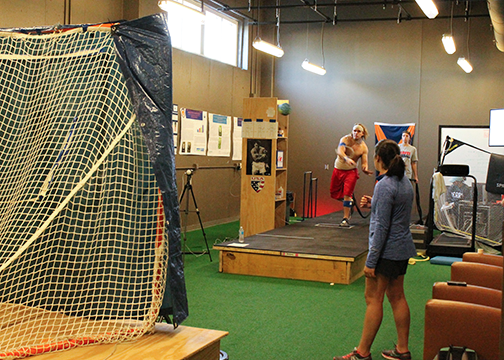 She has been in the lab for analysis and continues to collaborate with Oliver on her throwing program. Despite the star power of her program, Oliver’s most frequent lab subjects are local youth baseball and softball players. These youngsters receive the same motion analysis treatment as the pros. They get progressive reports from year to year after testing to see if the exercises are working. They almost always are.